Its a tale as old as time. You are asked by your close friend to be a bridesmaid- THE greatest honor bestowed to a friend- and then she hits you with the dress selection. Which may or may not totally highlight all your problem areas. Hey, if nothing else, your dress makes the bride look prettier for being next to you. And then you are stuck paying for an expensive dress that you will never wear again. I have one such dress in my closet as we speak. It is prom-dressy and a two piece AND if I had a dollar for the amount of times the bride told me I'd wear it again, I'd have at least $30. If I had a dollar for every time I've worn it since the wedding over 3 years ago, I'd be broke. Fear not bridesmaids-to-be, obviously, there are many other directions to go. There is actually a movement in the bridal industry to focus on bridesmaids. Which translates into a few designers as well as mainstream stores which are are offering bridesmaids dresses and not presenting them as an afterthought. I have been seeing a ton of J. Crew bridesmaids, The Limited bridesmaids, and Ann Taylor bridesmaids. Finding wedding appropriate dresses at stores that you already shop at? Love. So when I stumbled across this breath of fresh air, I had to share it! Introducing the coolest.bridesmaid.dress.ever. The amazing Two Birds Bridesmaid dress is one dress with FIFTEEN ways to wear it again and again and again. Bonus that its affordable and comes in a plethora of shades, lengths, and customizable styles. Genius! So whether you are a bride or a bridesmaid, make sure you look beyond the typical choices and be open to all the new, exciting possibilities in bridesmaid fashion. 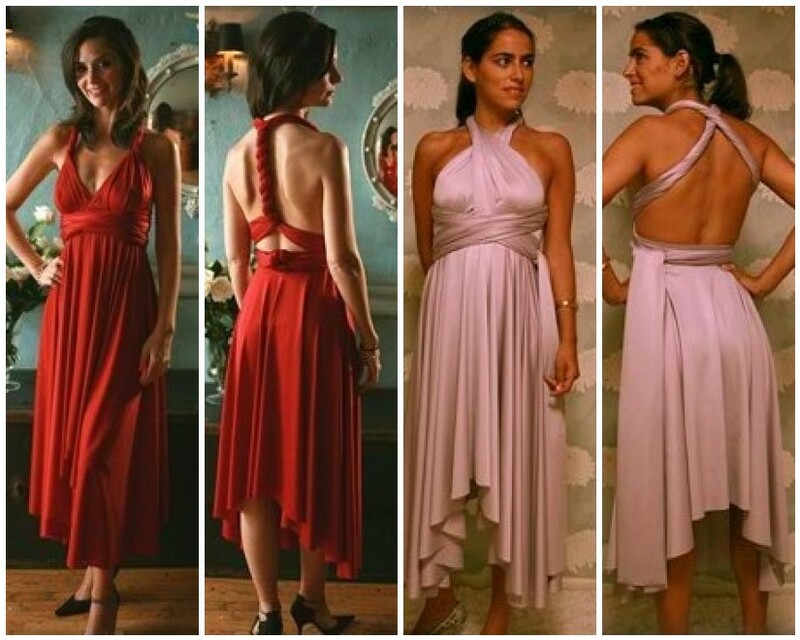 Below are just a few of the many ways to wear the Two Birds Bridesmaid dress. As always, enjoy!